When I first moved to Tucson, it rained most every day during monsoon season. I remember waiting for it to cool off in the evening so we could take the little ones to the pool. Inevitably we would wait in car as a storm swept by. 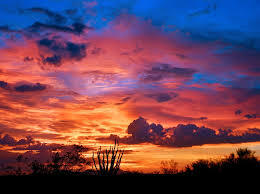 Then we would enjoy the most luminous sunsets as we swam - storm clouds catching the brilliant hues of the setting sun. That was the beginning of my love affair with this stunning desert. But it wasn’t until I witnessed the ravages of record heat and sparse rain on our own little monsoon garden that my heart became totally invested in fighting the effects of climate change on our desert town. I've often pondered how climate change would affect Tucson. Nobody knows exactly. But, from what I've learned, climate change often seems to intensify the extreme weather of a particular area. In that case, Tucson would continue to experience rising temperatures, prolonged droughts and more severe flash floods. That means even more flood damage as storms further erode the banks of hard, dried river beds. The desert will eventually return to it's natural state with or without us. But if we don't stop savaging the earth for profit, Tucson could become a stark, barren desert. If we don't change our ways now, even our iconic saguaros won't be able to survive the scorching heat. I sometimes wonder what will become of my little house after finally paying it off. If temperatures continue to rise, would my boys still want to live here? Would they even be able to sell the house if they decided to leave? That's one reason I'm dedicated to finding ways to lessen the impact of climate change on our town or at least find ways to live here comfortably. Anyone who is paying attention knows we need to reduce our dependency on fossil fuels and curb our wasteful consumer lifestyle if we want to stave off climate change. But for Tucson to be more resilient, we need to learn to responsibly use the resources the desert has to offer: the power of the sun, native flora and fauna, and our seasonal rainwater. We can start by implementing solar energy* to keep our air-conditioners running and planting native shade trees to cool our neighborhoods. But to be really sustainable we need to start living in harmony with the desert. No, I'm not talking about living off the land like the Hohokam before us. I'm not talking about giving up all of our modern conveniences. (Most of them can be adapted or retrofitted to be more environmentally sound.) 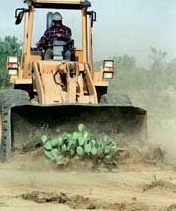 I'm talking about restoring as much of the desert habitat as possible in an urban environment. I'm envisioning our neighborhoods as desert oases with edible forests of native plants and desert rain gardens with drought tolerant heritage crops. 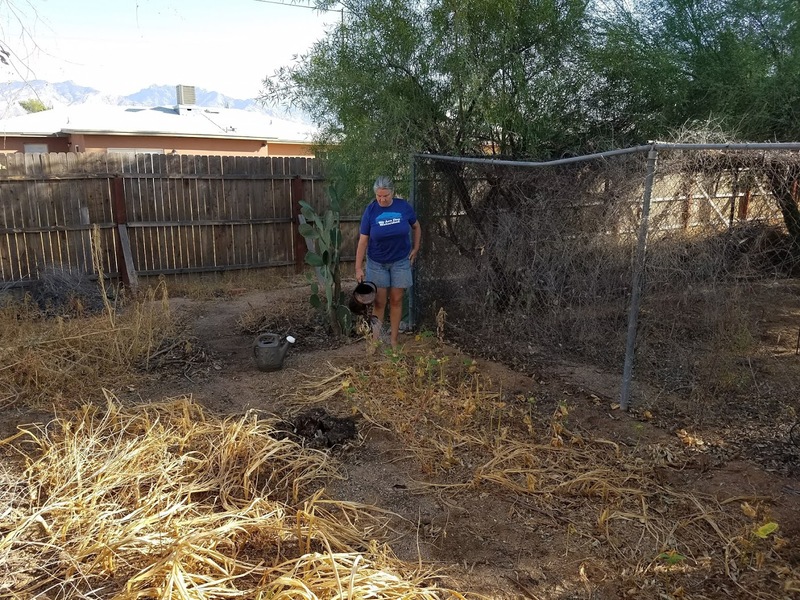 You've probably seen some lush desert landscaping or cool community gardens popping up around town. That's what inspired Dan and I to plant our own edible forest irrigated with rainwater and greywater and to start experimenting with drought tolerant crops. We are working towards food security. How do we transition Tucson into an urban desert oasis? The first step is embracing the nature of the desert we inhabit. Stop trying to force it into something it's not. Stop bulldozing it and paving it over for perpetual development. Shut off the sprinklers that water those little patches of grass in front of businesses. Sorry, manicured lawns don't belong in the desert - native plants do. We need to rethink our perception of tidy xeriscape landscaping and stop suffocating our native vegetation with plastic and mounds of gravel. Why on earth are we raking up all that great organic matter that could be nourishing our soil and allowing the rainwater to sink in? And all those weeds we "Roundup" can help prevent erosion. One of the biggest concerns of living in the desert is having a reliable source of water. Right now Tucson depends on CAP water. A whole coal-powered generating plant was built to run the pumps that push our water 336 miles uphill from the Colorado River. Unfortunately, that source isn't sustainable. As droughts continue, there will be more competition for that diminishing water supply. The good news is that there is enough annual rainfall to supply every Tucsonan's water needs - if we harvest the storm water. We need to redo our flood control infrastructure so water isn't directed to the streets to evaporate on its way out of town. But we don't have to wait for the city or county to approve expensive infrastructure improvements. 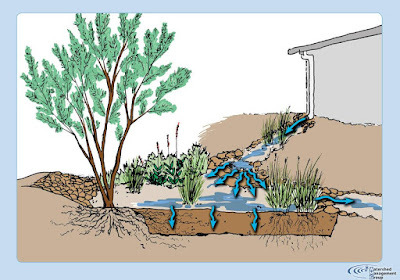 We can all incorporate rainwater harvesting features that keep the water in our yards to irrigate our native landscapes, edible forests and drought tolerant gardens. Diverting roof water to mulch covered catchment basins not only conserves water but helps to restore our aquifers as well. If you wanna see how it's done, you can tour Watershed Management Group's Living Lab and Learning Center. Using a combination of cisterns and earthworks, WMG harvests enough rainwater to meet all of their needs - including irrigating some fruit trees! But more important are their efforts to restore Tucson's aquifers and get our rivers flowing again. 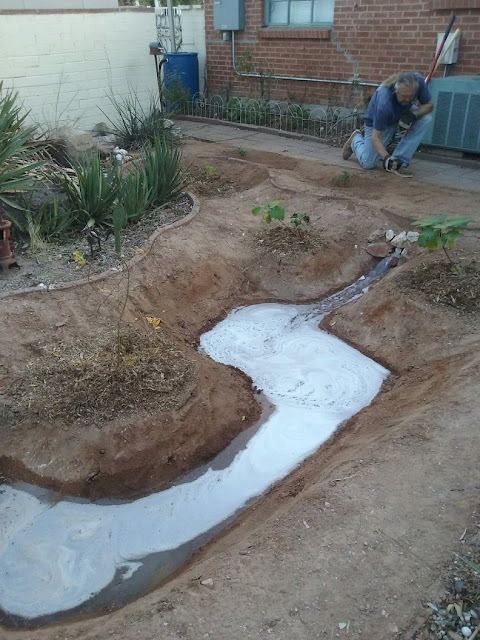 By returning our yards to a more natural state that allows rainwater to sink in, our hope is that it will replenish the Tucson basin and get the rivers flowing year around. But I have an even greater vision! Just imagine! If we could stop development in our floodplains, we could see the return of the mesquite bosques or stands of sycamore, willow, cottonwoods, ash, and black walnut trees that once hugged the flowing Santa Cruz. The riparian habitat would attract more birds and other wildlife to Tucson. Arizona is already a bird lovers paradise with ecotourism contributing to our $21.2 billion tourist industry. 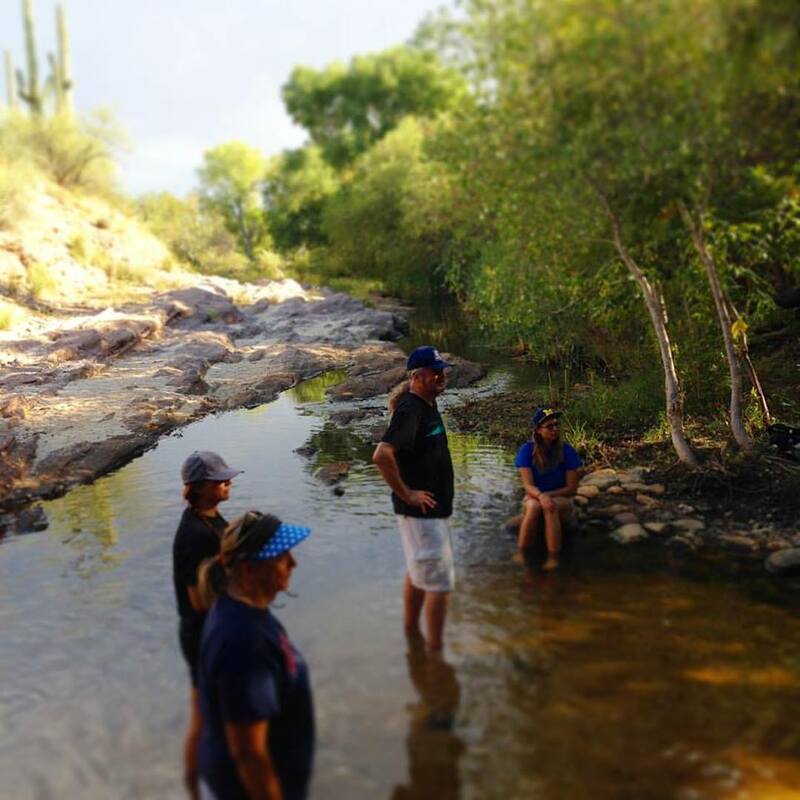 Imagine Tucson becoming the hub of ecotourism! This may seem impossible with our current "development is progress" mentality. But consider this - the city has plans to relocate family homes and businesses to widen Broadway. That is going in the wrong direction if we want Tucson to be sustainable. It encourages the growth of our car culture that accelerates climate change. What is your vision for Tucson? Would you like to ride your bike along a flowing river surrounded by twisty mesquite? Pick a fig from the orchard in the park? Enjoy the sight of hummingbirds, butterflies and other pollinators fluttering around desert shrubs in a traffic median? Snack on some yummy edible weeds without worrying about pesticides? Stop by a neighborhood garden stand for some freshly harvested salad fixin's? Wouldn't it be cool if a local farmer grew drought tolerant heritage white wheat and amaranth by the Santa Cruz river to be milled right here in Tucson and baked into healthy bread in Tucson's own native grains bakery? 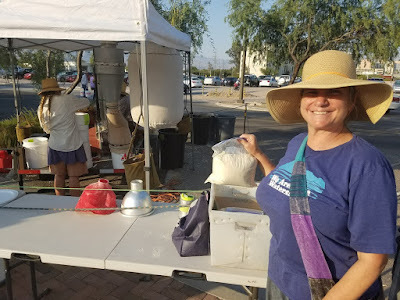 That's me holding a bag of freshly milled mesquite flour. I have a dream. 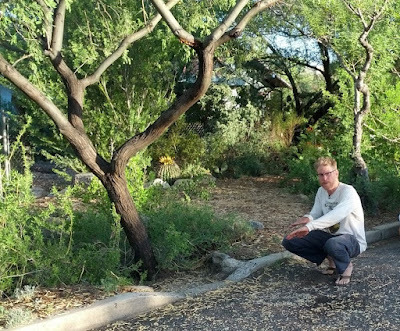 I believe Tucson can be self-sustaining if we reduce our dependency on fossil fuels, cut down on waste, restore our desert flora and fauna, and use the desert's resources responsibly. Instead of polluting our water by mining coal, we can use one of the desert's most abundant resources - the sun! Why not power our vehicles, homes and businesses with solar? We can retrofit our older houses and business buildings to conserve energy and water. We can have neighborhood micro food parks with safe bike and walking paths. We can make Tucson THE ecotourism destination by attracting more birds and wildlife to our urban desert. And all those desert trees sequester carbon! 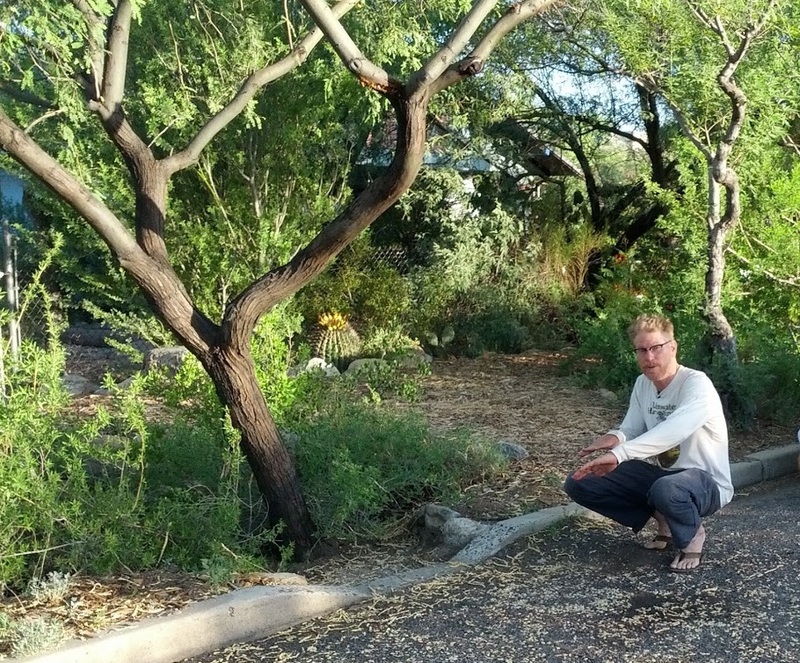 Brad Lancaster shows how a curb cut lets in street water to irrigate mesquite trees. We already have a great community working to make Tucson more sustainable: Sustainable Tucson, Feeding Tucson, Community Water Coalition, Sonora Environmental Research Institute, Sonoran Institute, Watershed Management Group, Tucson Water, the 2030 District, Local First, Zero Waste Tucson, UA Compost Cats, Desert Harvesters, Iskashitaa Refugee Network, Arizona Master Naturalists, The Sierra Club, Tucson Audubon Society, Mission Garden, Trees for Tucson, Native Seeds/SEARCH, the Pima County Seed Library, Living Streets Alliance, the U of A, the Desert Museum, and the Community Food Bank's Community Gardens. Several schools like Manzo Elementary and Changemaker High have gardens and there are already a number of neighborhood gardens. 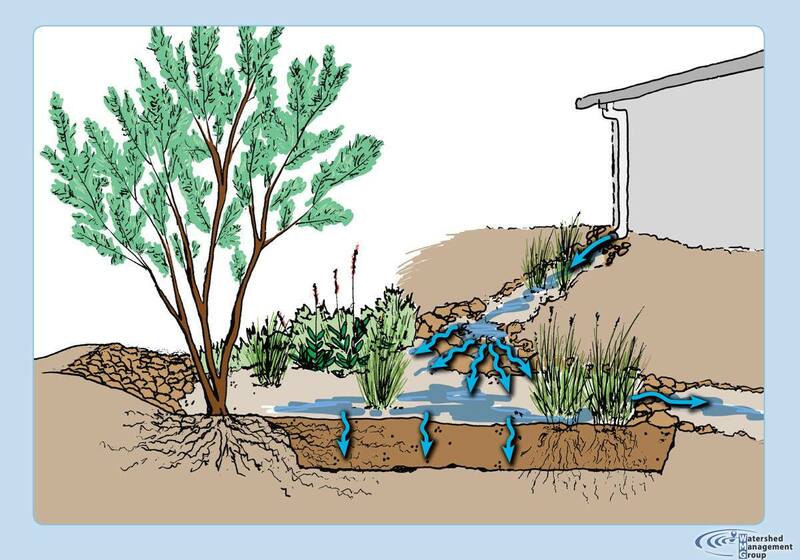 The Pima County Department of Environmental Quality is working on a manual for better green infrastructure. The City of Tucson and Pima County have pledged to fight climate change. Let's work together for a sustainable future for Tucson! Great vision, Jana. It is one we can all live with (as opposed to the "grow until we collapse" vision of an UNsustainable Tucson we have now). I have to quarrel with on thing, however. It may be possible to restore surface flow in the "shallow groundwater areas" along the Foothills and near A-Mountain. Water can overflow the escarpment near the Rillito and into the deep aquifer - without much loss. But our main aquifer can NEVER fill all the way to the surface because we will take it out and use it. Agua Calliente can flow again. The lower Rillito and Santa Cruz cannot. This should guide our design, because it makes a difference of Billions of gallons per year. Thanks, for your comment, Tres. I learn so much from you! But I'm still holding out for the Santa Cruz. I just wanted to clarify my comment about restoring the riparian habitat long the Santa Cruz river. That is a lovely dream of mine, but unpractical as long as there are houses (and streets) in the flood plain. But I still harbor a glimmer of hope that if the community came together we could restore that riparian habitat. 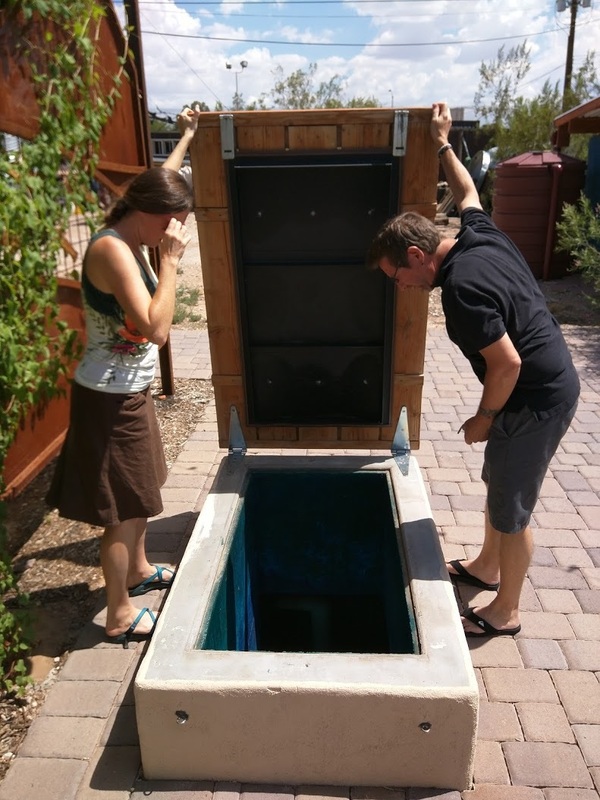 After all, we relocate houses and businesses to widen city streets, why not relocate houses to restore Tucson's aquifers? Which will serve us better in the long run - encouraging more driving with wider streets or restoring our flood plains? One thing is for sure, fixing our flood plains will save millions of dollars of flood damage. Consider the possibilities! Regarding my comment above. I rewrote the blog to clarify it. 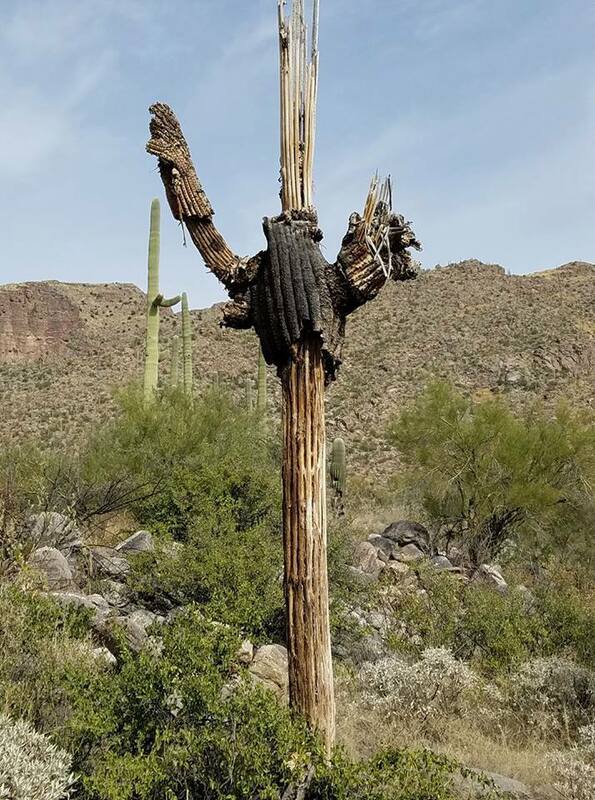 Wonderful work there in Tucson! Nice to see and learn how you are doing it. Thanks for putting your vision out there for us all, Jana! We would love to see this in the form of a documentary film, so that we can share it at the Alamos Film Festival in Sonora! 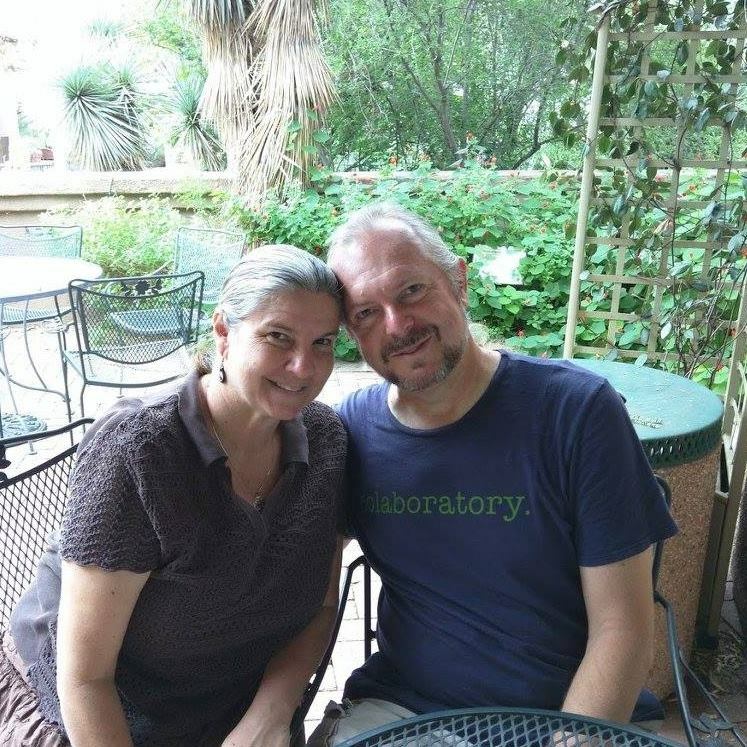 Hi Jana/Dan: Exciting project and weblog on the progress. It's amazing how barren-land can begin to restore...And little steps to create the basis for change (plantings, water catchments, etc) work synergistically to produce the results your seeing!